Surprisingly for a city cramped into a small area, Hong Kong boasts one of the world’s most-vibrant movie industries. However, in the post-1997 era (when Hong Kong returned to Chinese control), box office and cinematic art have been tepid. Many movie makers retired, and most movies were flat-out horrible. 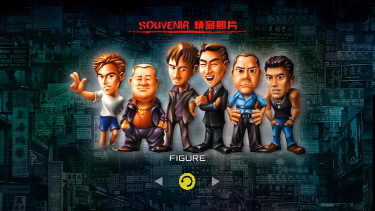 Jackie Chan, Chow Yun-fat, Jet Li, and John Woo were spending a lot of time in the United States. It was possible that Hong Kong cinema would never rise out of the trash heap ever again. Enter Infernal Affairs, starring some of Hong Kong’s biggest names like Andy Lau, Tony Leung Chiu-wai, Anthony Wong, and Eric Tsang. Like many other national cinemas, Hong Kong has high-brow and low-brow fare. Yet, Hong Kong is one of the rare places in which high-brow and low-brow can be mixed into one concoction without any sense of schizophrenia. Lau, Leung, Wong, and Tsang have all acted in extremely silly comedies, but their impressive range reveals sinister shadings in this riveting police procedural. 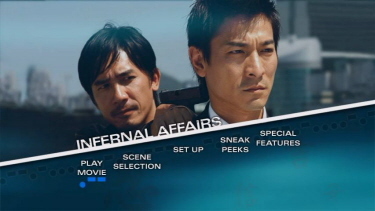 Infernal Affairs is a tricky, sly, tense examination of what happens when equally clever policemen and gangsters come up with the same idea--plant moles on the opposing team. The movie chronicles the psychological toll that undercover work takes on people, so the sudden, surprising action sequences have genuine resonance. The performances are top-notch, but the movie as a whole is very well-made. Intricate cross-cutting and aching music helped imprint the movie on minds across the world. 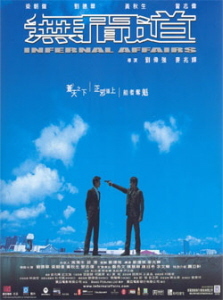 Infernal Affairs basically revived Hong-Kong cinema single-handedly, so it was no surprise that the moviemakers wanted to produce two more movies in a sequel-happy city. Since the backstory involving the two moles was as fascinating as what they did in the “present”, Infernal Affairs 2 was drafted as a prequel. 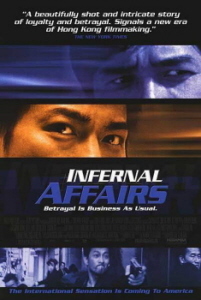 Infernal Affairs 3 details events following what happened in the first Infernal Affairs. Not only did these decisions provide a before-and-after appraisal of the characters’ lives, they also gave the characters a defining sense of closure. By the end of the trilogy, everyone related in some way to the two main undercover moles is either dead or has nothing left to do but mourn the dead. Perhaps the sense of finality is too pat and neat for some viewers, though the resolutions reflect the movies’ insistent references to Buddhist teachings about karma and fate. You can watch the movies in narrative order without undesired side effects. 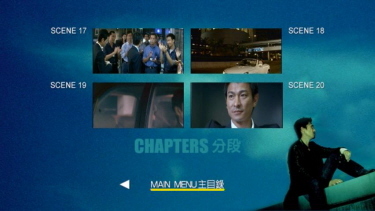 In fact, the R0 Hong Kong Limited Edition from Media Asia even includes a five-hour cut that arranges ALL of the movies’ scenes into strict chronological order. Big thanks to David McCoy for all the Screen Caps! The R1 2.35:1 anamorphic widescreen picture looks like it has a little more information on the sides than the R0 transfer. Otherwise, it has noticeable halos and mosquito noise. 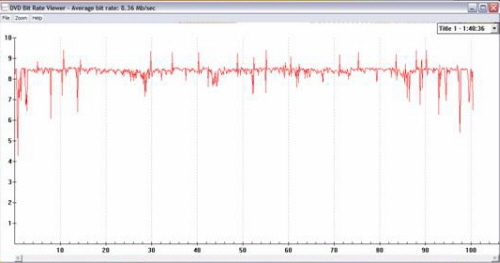 I assume the problems arise from the comparatively low bit rate. Also, the R1 is much darker than the R0. The R0 2.35:1 anamorphic widescreen image is generally much stronger than what you get with the R1 disc, though for some reason, a lot of text looks very soft. 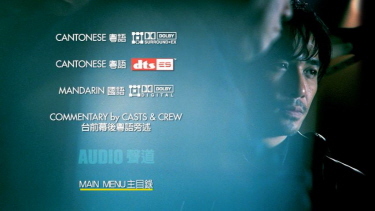 The R1 disc has Dolby Digital 5.1 Cantonese Chinese and DD 5.1 English dub tracks. They sound comparably similar to the audio offered by the R0 release. 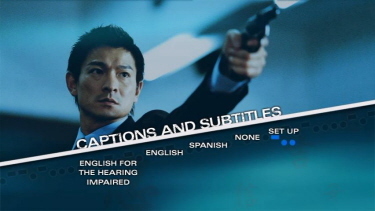 Optional English, English SDH, and Spanish subtitles as well as optional English closed captions support the audio. The R0 Media Asia disc offers Dolby Digital 5.1 Cantonese Chinese, Dolby Digital 5.1 Mandarin Chinese dub, and DTS 5.1 Cantonese Chinese tracks. Although the poignant and tense music cues are spread fairly wide across the front soundstage, the rears don’t have much activity since this is a dialogue-heavy drama. Nevertheless, there are deep bass extensions when appropriate. Optional Traditional Chinese, Simplified Chinese, and English subtitles support the audio. The movie-pertinent R1 extras are included in the R0 mega box set, though the reverse is not true. The R1 disc also has trailers for other Buena-Vista products. 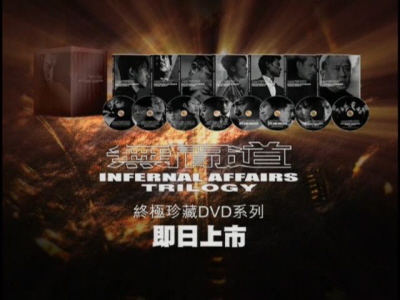 Well, Infernal Affairs is the biggest and one of the most-important Hong-Kong movies of the first decade of the 21st Century, so it gets the deluxe treatment in this box set. In addition to the extras offered by the original two-disc special edition, the extras disc for the first movie has several additional bonuses. 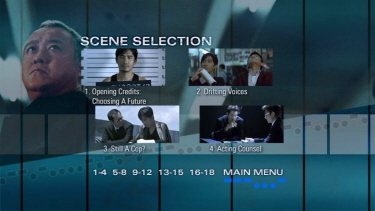 On the movie disc, you get an audio commentary by various members of the cast and crew. The other extras are on the extras disc. 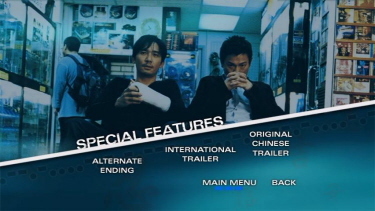 Upon loading, the Main Menu of the extras disc offers you two selections: “Additional Special Features” (not seen on other releases) and “Infernal Affairs Avicinar AKA” (special features already seen elsewhere). 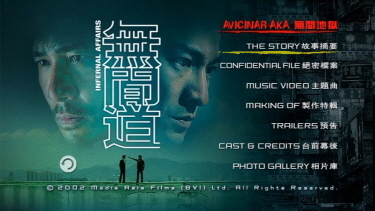 In “Avicinar AKA”, you’ll find “The Story” (text pages of plot summary), “Confidential File” (a promotional behind-the-scenes feaurette), Cantonese and Mandarin versions of the end credits song music video, a “making of” featurette, trailers for Chinese-language markets, text pages of information about the cast and crew, and photo galleries of a variety of things, including merchandising. One could argue that “Additional Special Features” provides more “meat” than the section with previously-released extras. In “Unseen Footage”, you get about 25 minutes of deleted scenes and flubbed takes. In “Interviews”, the directors talk about making the three Infernal Affairs movies and Initial D (Edison Chen and Shawn Yue appear in Initial D, too). In “Storyboard”, you get five storyboard comparisons to final edited scenes. 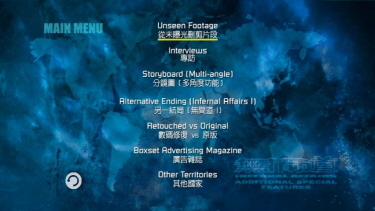 The “Alternative Ending” is an ending that was created for the Mainland China market. In the movie, the bad guy gets away with his crimes. This is unacceptable according to Mainland-Chinese censorship codes, so the alternate ending ends with the bad guy’s arrest. 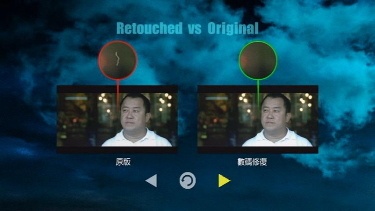 “Retouched vs Original” is a sample of frames that were cleaned up for this DVD release. “Boxset Advertising Magazine” is a long commercial for this box set’s release. Presumably, this was shown elsewhere to promote this limited-edition package. The “Other Territories” sub-section takes viewers to Japan, Korea, and the rest of the world with regards to the movie’s promotional campaign. For Japan, you get a press conference, footage from a premiere, interviews, and trailers/TV spots. For Korea, you get footage of the two male leads at a variety of photo ops. Finally, you get a gallery of international posters. 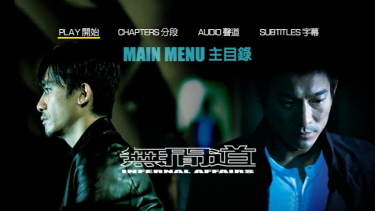 The R1 of Infernal Affairs is a lousy product. The video is too dark, there aren’t a lot of extras, and the cover art is an eyesore. 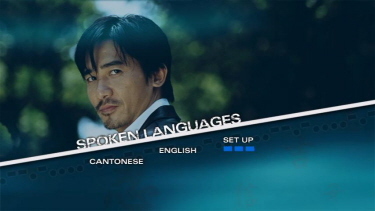 On the other hand, the R1 discs of the sequels from Genius Products/The Weinstein Company are commendable editions, and the R1 Infernal Affairs 2 DVD even has optional English subtitles for the Cantonese Chinese audio commentary. However, the R0 releases from Media Asia have all of the R1 extras and additional audio options. The R0 Limited Edition also has the aforementioned five-hour chronological edit, though the LE is usually difficult to find. The R1 products are for casual fans or curious viewers; otherwise, die-hards should get one of the R0 box sets (8-disc or 6-disc) from Media Asia. *Note: The Buena Vista R1 Infernal Affairs DVD is still the only official DVD release for that movie in the United States. The trilogy box set from The Weinstein Company includes a copy of the Buena Vista disc, but Weinstein is not offering its own stand-alone version of the first movie.